Hey guys, I built a simple reliable KZ650 vintage bobber. I love the bike and everything about it, but I cant seem to track down a custom frame. I've built my own frame components to make it a hardtail, lowered it, and built a seat and tank mounts for a '68 Harley peanut tank, vintage springer e Pera seat, and custom mounts for license plate and taillight. However, I'd like a stretch, I'd like to see it lower, and I'd like to see a bit of rake on the stock front end. For all these mods it would be much easier and probably a thousand times cleaner in appearance to get a custom bobber frame, however I haven't had much luck finding anything for it. Update on this Kawasaki KZ650 Chopper. sorry bud, when it comes to hard tails for kawasakis, youre on your own. i could probably fabricate one if i had a kz440 to work off of, but youd still have to get someone to weld it on, and it would probably be best to jig it before you weld it up. yo darren whats up i think i've seen your bike on youtube. i'm building a kaw 440 and was just wondering if you knew where to get a hardtail for it? I've started searching for "Kawasaki bobbers" on the net. I realize your post is old but I'm going to be posting the final assembly as it progresses. thanks guys, been doing a lot of work, still dunno what im doing with the frame, but the rest of the bike is coming together amazingly, enough so that changing the frame hasnt really occurred to me that much. check out G&Lchoppers.com they will make you a custom hardtail for about 350 there website is awsome hope thise helps. thanks, they do good work, i like what i see. im bound and determined to build my own, so ive talked to a few greybeards and figured out a best method to building my own frame, using a donor frame from another bike, same model and year. beleive me, when i build it, it will get posted. thanks! Check out G&L Choppers out of Colorado. I think you'll like what you see. Hey Darren, did ya pick a frame yet or do ya gotta kiss up to Santa big time? What year is your 650? I've got a bunch of leftovers from the donor bike I stripped for my KZ750 Twin cafe bike. I even have a complete frame, already stripped down in case you want to fab on that and still ride the bobber. Shipping would not be cost prohibitive as you are only next door in SK. I may even know of someone passing your way or vica versa. cool, small world. ive done some researching and decided on either a frame that ive picked out, or stripping the old girl right down to the frame and doing some major fabbing. thanks, ill check into that. Your bike is very cool, in fact I think I saw it one day on Circle Dr. I was rooting around on the net the other day and 'Red Neck Engineering' builds hard tail frames for all sorts of engine combos. The frames are reasonalbly priced too. Hope this helps. thanks guys, looked into both of these. so many cool options for this bike, trying to keep it pretty low budget. Do a google search for Cycle One. They are located in Regina, Saskatchewan, Canada. They have a nice rigid frame for around a grand and will custom tailor it to your rake/neck specs. I've got a '76 B1 750 Twin but decided to do it up Cafe Racer style. Once that bike is done (I'm wrenching on it right now), I have a sidecar project on the go for my BMW and an '83 Honda CM250 Custom my Daughter and I are building for her (along the same Bobber lines as your KZ is right now). 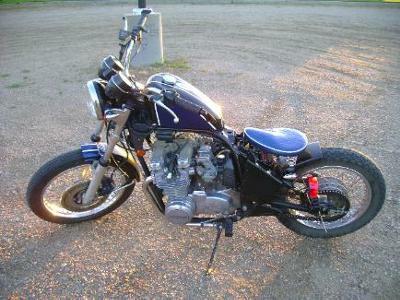 Then, if I'm still on the right side of the grass, I'll scout around for a good KZ1100 for a rigid chopper project.